Home / Search by Media Type / CD / WINGER: In the heart of the young CD. Check videos! 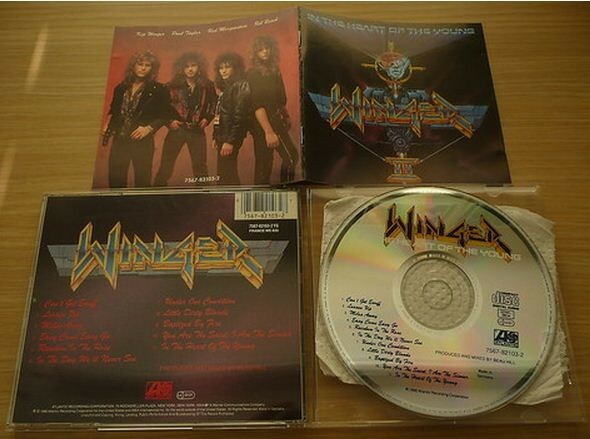 WINGER: In the heart of the young CD. Check videos! In the Heart of the Young was the second album by American glam metal band Winger. It was released by Atlantic Records in 1990. Musically, In the Heart of the Young followed closely in the footsteps of the band debut album. Once again produced by Beau Hill, the album features hook driven, progressive-tinged, radio friendly pop metal. There are, however, also some notable changes from the debut. In the second half of the album the lyrics take on a more serious approach than was typical for the genre and the band also stretches out into longer and more complex progressive passages than on the first Winger album. The album was certified platinum and produced such hits as “”Can’t Get Enuff””, “”Easy Come Easy Go”” and “”Miles Away””, the latter of which made the Top 20 at Billboard single chart. According to Kip Winger, “”Can’t Get Enuff”” and “”Easy Come Easy Go”” were late additions to the track listing, written because it was felt there were not enough rock songs on the album. The album itself peaked at #15 at the album chart. Winger followed the release of the album with a 13 month world tour, playing with KISS, Scorpions, ZZ Top, Extreme and Slaughter. Winger’s debut was an immediate commercial and critical success, selling in excess of a million units and making frontman Kip Winger’s chiselled look a household name, rivalling even the popularity of Jon Bon Jovi. At that point in time almost every teenage girl in the USA probably had a poster of him adorning their bedroom wall and every aspiring male rocker wanted to lead a band just as good as his. For this follow-up album, Kip retained all the positive points of his debut’s success, with no changes to either band members or his producer Beau Hill, except that this time around they elected to record in Los Angeles rather than New York City. Musically, “In the Heart Of The Young” followed closely in the footsteps of the band’s debut, however all was augmented to the stratosphere: bombastic, catchier, sharper, bringing together 11 tracks of superior Melodic Rock / AOR goodness. The sound is BIG, the hooks are huge and the songs were as every bit on the money as first time around. Kip’s familiar husky roar wraps itself around classic tracks such as “Can’t Get Enuff”, “Easy Come, Easy Go” or “Miles Away”. Reb Beach’s work on the six strings is phenomenal, whilst the rhythm section pounds away in a manner befitting some of the world’s most successful melodic hard rock acts like Whitesnake and Def Leppard. “In The Heart Of The Young” is simply terrific. It’s easily ranked amongst my favorite 50 Top albums of all time. It’s vibrant, glossy, pumpin’, cheesy at places if you want, but it’s that kind of records impossible to reproduce in the recording studio nowadays. The sound is awesome. While any Melodic Hard Rock / AOR fan already must own a copy in its collection. “In The Heart Of The Young” is pure gold.